Third world countries borders are being opened by the use of mobile devices and the Internet. Many people may not have shoes on their feet, but you could probably find them toting a Smartphone to and fro. Why? It’s a connection to the outside world, helping them stay connected across vast expanses. Mobile phones have also become a smart way to transfer money from one person to another. 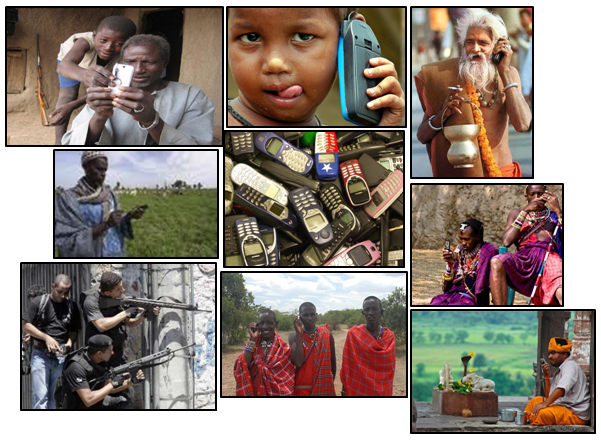 Recently, I read an article in the New York Times by Sara Corbett, Can the Cellphone Help End Global Poverty? In the article, Corbett shared the story of Jan Chipcase, who works for Nokia as a “human-behaviour researcher”. Mobile phones are the most popular way to access the Internet in third world countries. During a 2006 field study in Uganda, Chipchase and his colleagues came upon an interesting way a village shared a phone, a practice called sente. Ugandans are using prepaid airtime as a way of transferring money from place to place, something that’s especially important to those who do not use banks. Growing out of necessity, technology, specifically the mobile phone, is creating opportunities for men and women worldwide to not only connect with people, but also provide them with a form of income, and money transfer systems. But What about the “Digital Divide”? 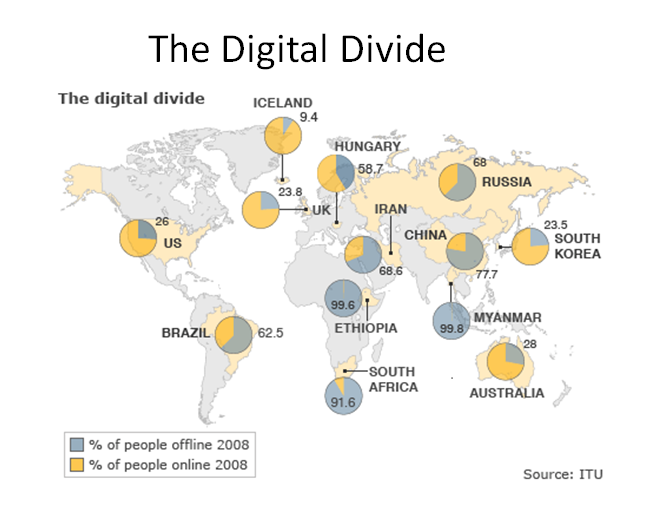 Unmistakably, there is still a digital divide, also known as the North-South divide. I recently came across a blog by University of Waterloo Professor Peter Carr, who lectures on information systems on technology. I looked at specifically his Week 2 Lecture on Technology and Third World Development. Carr explains that there are numerous factors that have led to the creation of this divide. First, the price of Internet access is a limiting factor for people in areas such as Africa, who have low access to monetary compensation. Computer hardware and access to the Internet (if it even exists there) is again an expense that few can afford in the third world. Telephone line and wired access shortages make it more difficult for people to connect, especially with a lack of electricity in rural locations. Lastly, the dominant Internet language is English, which many people in third world countries do not use as their native, or local language. The difference is made in the mobile sector, where Internet access is increasing through access from mobile phones. Internet access continues to struggle via desktop or laptop computers in the third world. In 2008, 91.6% of the population of Africa was offline, 99.6% in Ethiopia, and 99.8% in Myanmar, compared to only 9.4% in Iceland, 23.8% in the UK, and 26% in the United States. There is still a long way to go if we want to connect all people to the “outside” world. Internet access is allowing greater communication and opportunities for people in third world countries, but there are still many people who fail to have the basic Internet access that we enjoy in North America. Of all devices, the mobile phone is having the greatest impact on third world connectivity, but there are many factors that still hinder this progression. I love this 2-part series. I have read it a few times and enjoy it every time I do – makes me think!